I have been asked to serve in Fairfax County's Advanced Academic Program (AAP) Advisory Committee. In 2013, an external review of this program noted that "Overwhelmingly, parents and students believe that AAP is positive, important, and effective." In our neighborhood, my impression is that every parent wishes their child to be in an advanced academic program, and the children generally take pride when they are chosen to take classes that are advanced compared to those taken by their peers. Of course, all children should be provided an opportunity to acquire the greatest learning in their classroom. Equity is important. Placing students in an advanced academic program is, unfortunately, only the first step. Equally important to access is the effectiveness of the program. Sadly, in the case of the Advanced Placement (AP) program across high schools in the United States, greater access correlates with poorer learning outcomes. This is one of the major findings of a study published in the Review of Educational Research by Suneal Kolluri, a PhD candidate at the University of Southern California and a public school teacher in Oakland, California for nine years. All High School Advanced Academic Programs courses (Honors, AP, IB) in Fairfax county are open access, and do not require screening. And Fairfax county tries its best to place underrepresented students (Blacks, Hispanics, low socio-economic status) into its advanced academic programs. Worth noting is its Young Scholars program, which "is designed to find and nurture advanced academic potential in students from historically underrepresented populations". 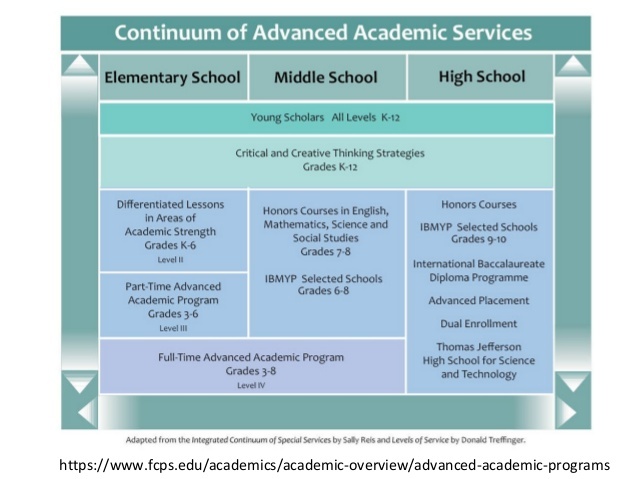 Although, advanced curriculum is available to all students in both middle and high school, the programs for elementary are not. Since Blacks, Hispanics and children from poor families are underrepresented in the advanced academic programs in elementary, they are therefore less likely to be prepared or motivated to participate in more challenging or rigorous courses in middle or high school. 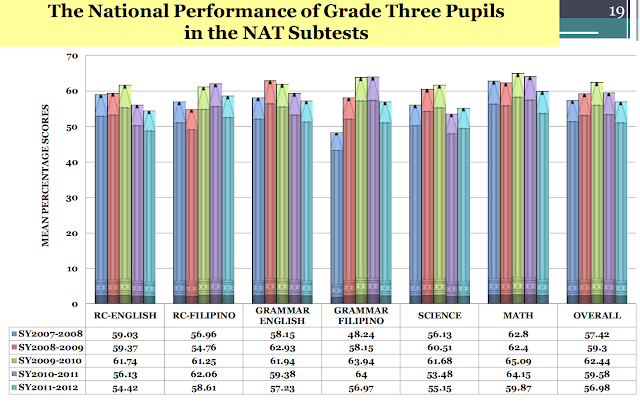 The Young Scholars program tries to correct this inequity. "Some research suggests instructional shortcomings of AP curriculums, especially at schools serving marginalized students." A substantial body of research documents the challenges of schools serving low-income students (Harper, 2015). Schools in low-income neighborhoods lack quality teachers (Eckert, 2013; Ronfeldt, Loeb, & Wyckoff, 2013), face elevated levels of school violence (Kitzmiller, 2013), and struggle with persistent underachievement (Levin, 2009; Zhou, 2003). The challenges of limited resources and stubbornly low achievement might likely carry over into the AP programs at these schools, but research in this area is limited. Klopfenstein (2003) argues that effective AP courses require significant financial resources and highly trained teachers. Effective instructors may be particularly necessary given the breadth of coverage expected of AP courses. From this standpoint, improving AP access and effectiveness for students from marginalized backgrounds might be contingent on more general efforts to improve urban and rural education. The last sentence of the paragraph is especially striking. In basic education, achieving excellence is contingent on achieving genuine equity. Advanced academics can not really thrive without first improving education for all. Your site is very informative and interesting. I am very happy to see this post. You discuss about Advanced Academics. I am waiting for your next post about paraphrasing help information. 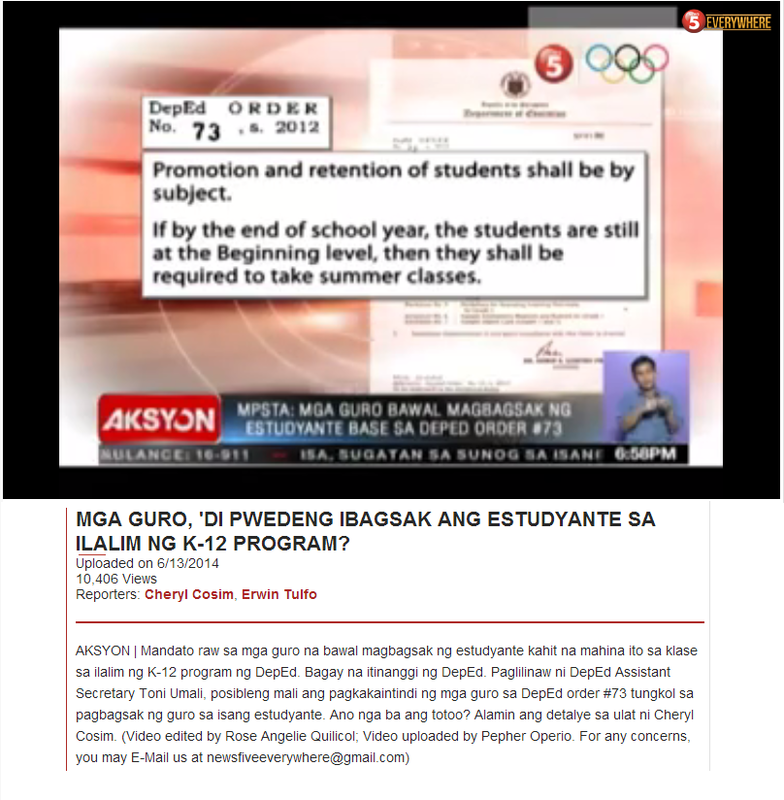 "Nosebleed, Don't English Me, I'm Panic"
What Should DepEd's First Priority Be?